Some heavy hitters are here in Rotterdam this week, with 500 points on the line. Murray took a late wildcard to add some sparkle. Dutch tennis is in re-bulding mode. Robin Haase is their top player ranked 46 and has a good game indoors. Perhaps more dangerous is Igor Sijsling, and at 6’3″ has a big serve and already has taken down Mikhail Youzhny in round 1. The last Dutchman to win the event was Richard Krajicek in 1997. Defending Champion: Juan ‘The Hammer’ Del Potro – The world No. 4 vies for his 19th tour-level title. Nasty Floater: Jerzy ‘the Pole-Axe’ Janowicz – World no. 20 comes in with a 6-3 record and plays Tommy Haas next. Veteran Watch: Tommy ‘Gun’ Haas – The 35 year old made a final last week in Zagreb. Pushing the top 10 this year. Up and Coming: Grigor Dimitrov – World no. 19 comes in with a 5-2 record this week and looks to score some points. Slumping: Phillipp Kohlschreiber – PK slipped up last week in loss to Daniel Evans so needs to make amends this week. On Fire: Tomas ‘T-Berd’ Berdych – Comes into Rotterdam after winning all three of his rubbers in the first round of the 2014 Davis Cup. My pick: Andy Murray – The Murricane should collect his 29th career title barring injury. Did You Know? The tournament celebrated its 40th anniversary in 2013. Plenty of US talent on display this week in Memphis including Jack Sock, Ryan Harrison, Tim Smyczek, Donald Young and Denis Kudla. Veteran support includes Michael Russell. A big opportunity for one of these to make a run. Kei Nishikori and Lleyton Hewitt bring the star power. Defending Champion: Kei Nishikori – Helped Japan to victory against Canada in the 2014 Davis Cup first round in January. Nasty Floater: Marcos Baghdatis – The Bagman plays Hewitt next and needs to regain former glories. Veteran Watch: Lleyton ‘Rusty’ Hewitt – Makes his fourth appearance in Memphis with 1 title to his name this year. Up and Coming: Jiri Vesely – The 20 year old Czech is 6’6″ with a massive serve and ranked 81 already. Slumping: Sam Querry – Q-Ball just can’t get it together so far with a loss to Alex Bogomolov. On Fire: Yen Hsun Lu – Comes in with a 6-2 record this year and making the jump from the Challenger tour grind. My pick: Kei Nishikori – His to lose. May have a tough time against Hewitt in the semi-finals if they meet. Did You Know? The U.S. National Indoor Tennis Championships is played at the Racquet Club of Memphis, the only private club in the world to host a professional men’s and women’s combined indoor event.. 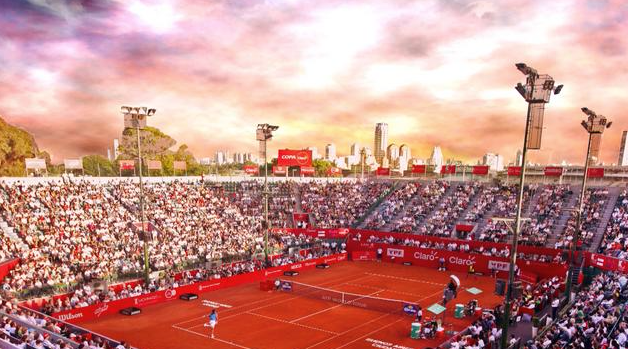 The Copa Claro is the third stop of the four-tournament Latin American swing, and is contested on clay at the Buenos Aires Lawn Tennis Club, known as the “Cathedral of Argentinean tennis”. Argentinian tennis is without David Nalbandian who retired last season and with no Juan Del Potro here (playing Rotterdam) they are left with the struggling Juan Monaco and Horacio Zeballos; wildcards Guido Pella and Facundo Arguello; and the exciting Federico Delbonis. Defending Champion: David Ferrer – The two-time defending champion is 7-3 in matches this season. Nasty Floater: Carlos Berlocq – A real threat on clay to anyone. Veteran Watch: Tommy Robredo – Chases his 12th title on clay and 13th overall. Up and Coming: Guido Pella – The Challenger year-end champion from 2012 has already upended Willy Garcia Lopez. Slumping: Alex Dolgopolov – Unseeded and desperately needs to get his head in the game. On Fire: Fabio Fognini – The flying Italian is 9-2 in matches this season and dominating on clay. My pick: David Ferrer – Should claim his 3rd title here and 21st in his career. Did You Know? An Argentine has reached the final in nine of the 11 editions of the ATP World Tour 250 tournament, with champions including Guillermo Coria, Gaston Gaudio, Juan Monaco and David Nalbandian.